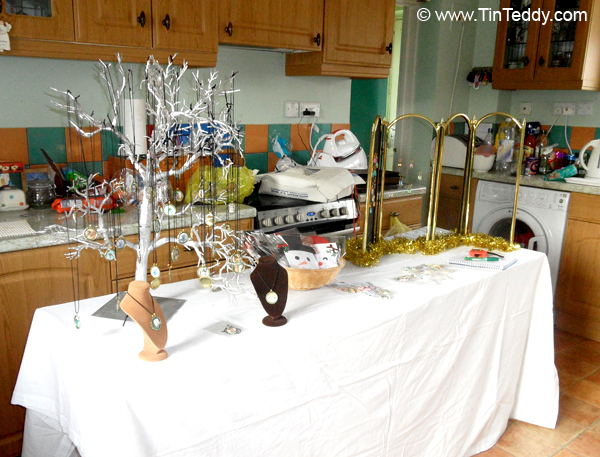 It can really pay to assemble your stall at home before doing a craft fair, I call this a craft stall dress rehearsal. Set up your table somewhere safe and dry at home. Cover your table in a tablecloth or similar. Fabric tends to look better, but paper cloths are better than a blank table. You may like to have a second, smaller cloth on top. Plain cloths are usually preferable so as not to distract the eye from your products. Make sure you have your signage sorted. Many people dislike asking what the price of an item is, and will not do so. So everything on your stall should be clearly priced. Spend time on your signage so it looks neat and attractive – I have seen many stalls of lovely items that appear scruffy simply because of the hastily hand-written signs. You can put things like boxes or books under your tablecloth – this can really help display items at the back better. Don’t forget to decide where you will put things like your business cards, leaflets or promotional material. It may be easier to pop business cards in a shallow box to avoid them getting knocked on the floor. Here is a picture of a stall dress rehearsal being set up in the kitchen. Arranging things and seeing how best to display the various types of items. You may want to draw a little sketch of the finished stall for reference when setting up on the day. Here is a link to my free, printable Craft Stall Checklist, to help you remember everything you need on the day. For lots more information on craft stall preparation, check out my in-depth article, Preparing for a Craft Stall or Craft Show – you can also listen to this article as a podcast too.